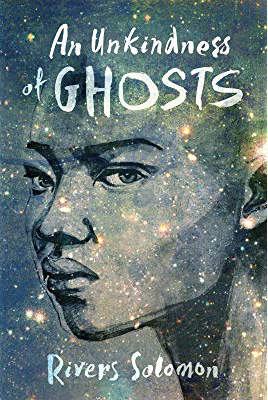 Rivers Solomon’s debut novel, An Unkindness of Ghosts, was published last year to critical acclaim and subsequently awarded the Community of Literary Magazines and Presses’ Firecracker Award in Fiction. The novel is set on board the generation ship Matilda, years after a mysterious disaster wiped out the ship’s high-ranking officers and with them, the knowledge of where the ship was heading and why. Now, the ship is controlled by a theocratic Sovereign. Dark-skinned lowerdeckers are born into slavery, while light-skinned upperdeckers live in luxury. Aster is a scientifically brilliant lowerdecker whose mother disappeared when she was a child. When Aster realizes that her mother’s journals are written in code, she becomes driven to find out what her mother knew and what happened to her. In exploring the Matilda’s social microcosm, An Unkindness of Ghosts examines intersections of identity and oppression along lines of race, class and gender. Alex Falck: Did you have a specific audience in mind when you were writing? If so, how did that affect your depiction of the characters and their story? Rivers Solomon: I didn’t, no! I feel like first novels often have the luxury of being projects you do for yourself and yourself alone. It might not seem like it because it’s just a brutal world, but a lot of An Unkindness of Ghosts is just a compilation of all of my favourite things thrown together. All of my quirks, all of my interests, all of my loves are right there on the page. AF: It’s tempting to apply contemporary labels to your characters, like trans, intersex, nonbinary, asexual, but those labels don’t exist in their world. Combined with the theme of ghosts and ancestors, it made me think about the issue of looking for LGBTQIA people in history. On one hand, there’s a valid argument to be made against applying the labels we use to people who often had very different conceptions of their gender and sexuality. On the other hand, there’s a lot to be gained by recognizing that queer people have existed throughout human history. Was this something you were thinking about as you were writing? RS: I absolutely was thinking about it, and I’m not sure I feel satisfied with my own solution in the text. Part of me wonders if I should’ve labelled by characters according to contemporary definitions of gender and sexuality so there’d be no doubt in anyone’s mind. To me, all of these labels are context dependent and therefore it does not feel authentic or organic to use words that have developed out of our contemporary discourse to describe my characters. For example, largely everyone in Q-deck, where the protagonist Aster lives, uses she/her pronouns and are generally interpreted as women, and most people are intersex. “Lesbian” doesn’t make sense as a meaningful word in a world where almost everyone someone would be attracted to is a woman. Certainly neither does “straight” when everything about their bodies and sexual expression is otherised. AF: Does it bother you when readers apply labels that the characters don’t use? RS: It doesn’t bother me at all! I use all of those words myself to describe them. Aster is an intersex butch lesbian, but maybe agender. Theo is a nonbinary trans woman. These are my interpretations, but arguments could certainly be made for other classifiers. Part of the beauty of avoiding labels to me is that it’s saying “identities aren’t sacrosanct.” To me, they’re not objective truths or innate biological realities. Rather, they’re part of the way we choose to interpret ourselves in a vast network of information and social relationships. 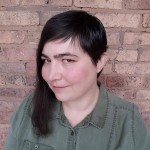 AF: Aster isn’t the sort of character who usually gets to tell her own story; in our society, she would be considered autistic and probably intersex and nonbinary. Did you feel any pressure to temper the character in order to make the book more “accessible” or marketable to a mainstream audience? What difficulties did you face in bringing us Aster’s story? RS: I didn’t feel that pressure exactly, no. You know, it never occurred to me that those things would hurt my chances at publication. I was really naïve, I suppose, which is good, because it meant I got to write the characters I wanted to write the way that I wanted to write them. I did have one person tell me that writing Aster as autistic was a “crutch” and not very interesting, but that never influenced how I wanted to write her. I also feel really blessed that neither my agent nor Akashic Books wanted any changes along those lines to make it more marketable or accessible. Thank goodness for independent publishers. AF: What would you like to say to young trans people who want to be writers? RS: Make your story as unapologetically and unabashedly yourself as you can. Thank you to Rivers Solomon for taking the time to talk with me. Look for their next book, The Deep, to be published in June 2019. Alex Falck is a children’s librarian at the Chicago Public Library. Alex is particularly interested in hearing and amplifying the voices of historically silenced people, including people of color, LGBTQIA+ people, and people with disabilities. Alex listens to lots of podcasts, and blogs at teenlib.tumblr.com. Find them on Twitter @AlexandriaFalck.